Which oil, olive or walnut? THERE IS A LOT OF CONFLICTING ADVICE ABOUT WHICH OILS WE SHOULD EAT. FROM OLIVE TO RAPESEED, PALM TO WALNUT, IT’S NOT SURPRISING WE END UP CONFUSED OVER WHICH WE SHOULD POUR OVER OUR FOOD. So let’s focus on two oils at the top of many people’s shopping lists. Walnut and Olive. Put head to head, which oil comes out on top? A supermarket favourite for years, olive oil has many health benefits, demonstrated in thousands of studies. Olive oil forms a large part of the Mediterranean diet, which is proven to be one of the best diets for heart health. So what makes it so good for us? The answer is (MUFAs), or monosaturated fat. These miracle workers make up 73% of olive oil, compared to walnut oil’s 23%. Consume enough of them you’re less likely to have a stroke, suffer from high blood pressure or have high cholesterol. It’s not just the fat that makes olive oil so healthy. Extra-virgin olive oil also contains many antioxidants and anti-inflammatory phytochemicals that boost heart health. It doesn’t seem to matter how you consume it either. Research shows that even when you fry with olive oil, the health benefits stay the same. The same cannot be said of walnut oil, which can become slightly bitter when heated. Can olive oil really be bettered? In some ways, yes. One study showed that walnut oil is superior to olive oil in terms of reducing cholesterol. Eating walnuts causes blood vessels to expand and allow more blood through. It can also reduce plaque in arteries. Walnut oil also contains 10 times more of the omega-3 fatty acid ALA (alpha-linolenic acid) than olive oil. Just one tablespoon has as much as a salmon fillet. 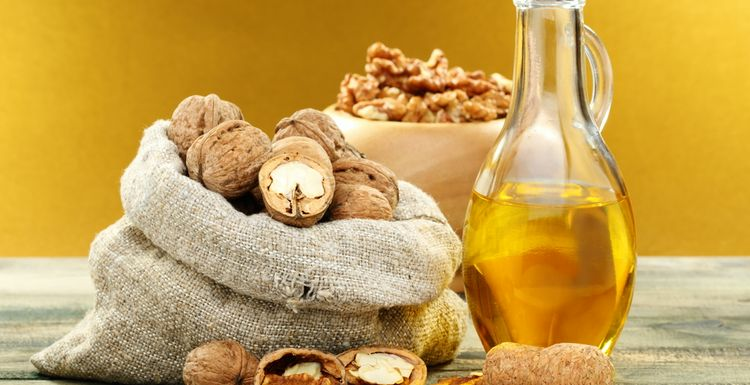 In fact, walnut oil is one of the few plant sources of omega-3 fatty acids. Yes, it can be pricey, but walnut oil tastes amazing, and because you should use it only for cold dressings (such as these tasty healthy dressings) it should last you ages. We know they’re both amazing for us. And the good news is that the benefits of olive oil and walnut oil are even pronounced when combined. A recent study explains “phytochemicals with antioxidant and anti-inflammatory properties contained in extra virgin olive oil might act synergistically with walnut-derived bioactive compounds”. In plain language, that means eating olive oil and walnut oil together is better than either on their own. So you can go ahead and enjoy both! The flavour of walnut oil adds so much to meals but we're firm coconut fans here. I need to look into the health benefits of rapeseed oil based on the other comments though. rapeseed oil can also be British sourced for those wanting to reduce their food miles. Perhaps time to change from olive oil, or at least go half and half? Personally I just buy rapeseed oil, which is meant to have the health benefits of olive oil but is half the price!